Lizzie Daily was born in July 1842 at Ireland.1,2 She married William Henry Holcombe, son of Amos Bull Holcombe and Harriett Barber.1 Lizzie Daily died in 1918 at Kansas City, Wyandotte Co., KS. Louis Byron Holcombe was born in January 1871 at KS.1,2 He was the son of William Henry Holcombe and Lizzie Daily.1 Louis Byron Holcombe married Rose Spaeth. Louis and Rose were enumerated in the 1920 Kansas City, Wyandotte Co., KS, federal census. He was a clerk in the county water and light, age 49, she was 43. The only child in the household was Mary R. 3 years 5 months. Louis and Rose were enumerated in the 1930 Kansas City, Wyandotte Co., KS, federal census. He was collection manager and the water and light, age 59, she was 53. The only child in the household was Mary R., 13. Mary Holcombe was the daughter of William Henry Holcombe and Lizzie Daily. Mary Holcombe died; at age 2. Rose Spaeth was born in November 1877 at KS.1 She married Louis Byron Holcombe, son of William Henry Holcombe and Lizzie Daily. There was a Rose Spaeth enumerated in the 1910 Quindaro Twp., Wyandotte Co., KS federal census in the household of parents John and Carrie. Rose's age was 30 something. Rose Spaeth died in 1972. Daughter Taylor was born in September 1841. She was the daughter of Levi Taylor and Mary Landon. Sarah Campbell was born on 3 September 1815. She married Levi Taylor. S. D. Perry married Alvira Taylor, daughter of Levi Taylor and Louisa Holcombe. George Thomas Duren married Verna Harrison. George and Verna were enumerated in the 1930 Houston, Houston Co., TX, federal census. He was a farmer age 30, she was 30. Children in the household were Doris 4 years 2 months, Colleen 3 years 2 months, and Verna F. 5 months. Verna Harrison married George Thomas Duren. Maxwell Case Jr. was born on 2 August 1924 at Erie, Erie Co., PA. He was the son of Maxwell Case and Beulah Jones. Maxwell Case Jr. died on 12 October 1942 at Savo, Solomon Islands, South West Pacific, at age 18. MAXWELL CASE, JR, eighteen-year-old seaman,formerly of Erie and Edinboro, met death "somewhere in the Pacific in defense of his country" the U.S. Navy department announced today. The youth left Edinboro High in his sophmore school year to enlist in the Navy Aug 14, 1941 and was last heard from by Erie and Edinboro relatives in June when he wrote that he was leaving for a post " in the Pacific "
No details of the events surrounding the young second class seaman's death have been revealed by the Navy department and the ship he was aboard has not been revealed. The youth was a native of Erie and following the separation of his parents and death of his father, made his home with his grandparents until their death four years ago. He resided with an uncle, Donald D Case, of Edinboro ...since that time until his entry into the Navy. He is survived by several uncles and aunts...it was reported by relatives.. Although details of the youth's death were lacking, it was believed that he may have been killed in action during one of the naval engagements between U.S. and Jap fleets in the Solomons area. Note....Maxwell CASE Jr. served on the U.S Destroyer Duncan ....ship was sunk as a result of enemy fire at the Battle of Savo Island., Solomon Islands. ...Maxwell Case Jr was buried at sea....a monument to his death is located at Manila American Cemetery, Manila, Luzon, Philippine Islands....Awards : Purple Heart. Charlotte A, (?) was born in March 1835 at Jasper, Steuben Co., NY. She married Sherman Holcombe, son of Levi Holcombe Jr. and Harriet Elliott, on 7 May 1861 at Annin Creek, McKean Co., PA.
Camilla Rosemary Shand was also known as HRH Camilla Duchess of Cornwall. She was born on 17 July 1947 at King's College Hospital, London, England. She was the daughter of Maj. Bruce Middleton Hope Shand and Hon. Rosalind Maud Cubitt.1 Camilla Rosemary Shand married Andrew Henry Parker Bowles on 4 July 1973 at The Guard's Chapel, Wellington Barracks, England. 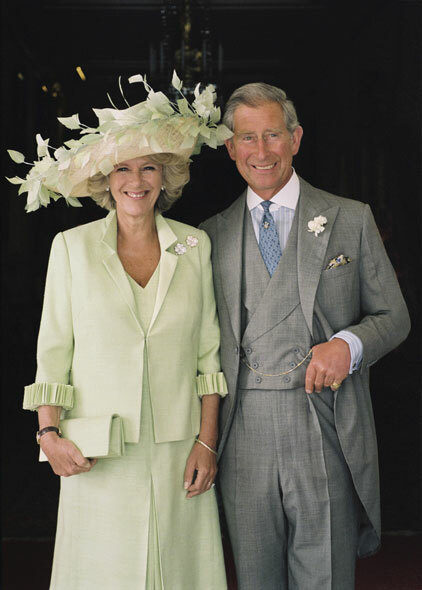 Camilla Rosemary Shand married HRH Prince Charles Philip Arthur George Prince of Wales, son of HRH The Prince Philip Duke of Edinburgh and HM Queen Elizabeth Alexandra Mary, on 9 April 2005 at Guildhall, Windsor, England. As compiled by William Addams Reitwiesner, Camilla has many notable relatives. Ironically, she is related to Diana Frances Spencer. Their common ancestor is William Anne Keppel, the 2nd Earl of Albemarle. She is related to Henry David Thoreau, the essayist through common ancestor Elisha Jones. She is related to her husband Prince Charles, through their common ancestor Henry Cavendish. She is related to Jenny Westphalen, wife of Karl Marx, through common ancestor Sir Robert Campbell. She is related to canadian singer Celine Dion through common ancestor Jean Guyon dit Dubuisson. She is related to singer Madonna, Louise Veronica Ciconne, through their common ancestor Zacharie Cloutier. She is related to Eleanor Roosevelt, wife of President Franklin Delano Roosevelt, through common ancestor Jean Crommelin. "Alfred W. Excell, 74--a resident of Palmyra for a number of years died at his home on Main Street Saturday, March 28, at 11:00 p.m., after an illness of several months. "Mr. Excell was born January 22, 1862 in Kent, England, the son of Alfred and Sara Sharp Excell, and came to America in his early boyhood, locating in Huron, South Dakota where he took up a claim. In 1889, he moved to Whitewater and was employed by the Esterly Harvester Co. After which he purchased a farm near Palmyra where he lived until he moved to the village. "He married Cora Meister February 26, 1916, who survives, besides he two sons Percy of Highmore, S.D. and Charles of Kenosha. Mr. Excell was a man of good principles, and possessed many good qualities of character and was well liked by his associates and all who knew him. "Funeral services will be held at 2:00 o'clock this (Thursday) afternoon in the Masonic Temple, the Rev. A. L. Tucker of Footeville and the Rev. M. B. Leisman of Palmyra officiating. Masonic services will be conducted at grave in Hillside Cemetary." Charles and Martha were enumerated in the 1930 Kenosha, Kenosha Co., WI, federal census. He worked in an Iron Foundry and was 34, she was 35. The only child in the household was Charles, 7. [S182] Social Security Death Index (on-line), Ancestry.com, SSDI, Ancestry.com, SSAAN 331-10-5679. [S562] Orlin P. Fay, Fay Genealogy, page 19. [S713] Rhonda R. McClure, Thomas Brigham, page 3. [S562] Orlin P. Fay, Fay Genealogy, page 21. John P. and Emma were enumerated in the 1930 Township 109, Hyde Co., SD, federal census. He was a farmer, age 44, she was 41. Children in the household were Virginia P. 10. Howard E. 9, June V. 7, Harold J. 4 years 5 months, and Fern J, 1 year 4 months.